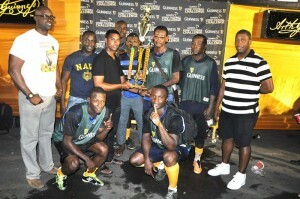 Banks DIH representative Tony Ramcharran (3rd left) hands over the first prize money and trophy to Showstoppers Captain Marvin Josiah in the presence of Guinness Brand Manager Lee Baptiste (left), Outdoor Events Manager Mortimer Stewart (right) and teammates. beaten finalist Pouderoyen Showstoppers erased a 1-0 deficit to clinch the West Side Guinness ‘Greatest of the Streets’ Futsal Competition after beating Shattaville Gunners 4-1 in the final on Tuesday, at the Pouderoyen Tarmac. Finding themselves trailing following a long range missile from Marvin Henry after twenty-nine minutes in the opening period, the host first had to ensure that they did not fall further behind and went to the break, trailing the visitors by the lone goal. The start of the second period clearly signaled that the discussions during the break centered on a change in strategy as they attacked with menace, but poor finishing kept the Gunners clinging to their marginal lead. However, that changed seven minutes into the period when Dexroy Adams, who was among the culprits that missed easy opportunities, made amends for his earlier lapses when he booted in from close range to level the scores. Visibly the more organised of the two teams, Showstoppers continued their relentless attacking forays and the prolific Marvin Josiah, who just like Adams had muffed a few chances, was able to captilise on a defensive blunder to hit past the last stop in the 55th minute for a 2-1 lead, sending their supporters into wild celebrations. The two winners (centre) pose with their Coolers flanked by Banks DIH representatives on Tuesday night, at Pouderoyen Tarmac. counter attacks which was skillfully exploited by Showstoppers as Adams weaved past one defender on the break and he finished with aplomb in the 59th to complete a brace. With time running out, the Gunners charged forward in numbers and again was penalised for that recklessness as Josiah returned to match his teammate after sliding in a pass from centre-field that provided the final nail in the Gunners coffin and secure the top prize that had eluded them last year. The victory was a good result for a team that was a model of consistency throughout the 2016 campaign to date and now places them in the national playoffs along with beaten finalist Shattaville Gunners. In the playoff for third place, Harmony Ballers led by a double from Kevin Richards, who netted in the 3rd and 36th minute and a single strike from Vernon Munroe in the 7th coasted to a comfortable 3-0 triumph over Brothers United. The winning team carted off $300,000 and trophy, while 2nd, 3rd and 4th placed finishers took away $200,000, $100,000 and $50,000 respectively along with trophies. Among the other sponsors on board were Trophy Stall and Colours Boutique. 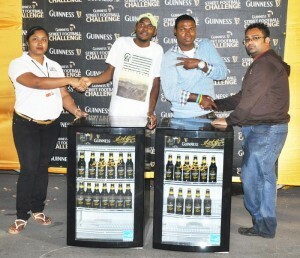 Meanwhile, two lucky fans were able to win a Guinness Cooler each compliments of the main sponsor Banks DIH. The night’s full results: Final – Shattaville Gunners-1 vs Showstoppers-4. Showstoppers Scorers, Dexroy Adams-37th and 59th, Marvin Josiah-55th and 60th. Shattaville Gunners Scorers, Marvin Henry-29th. Third Place Playoff – Brothers United-0 vs Harmony Ballers-3: Kevin Richards-3rd and 36th, Vernon Munroe-7th.